There will be days that your faith will be place to the test. Keeping a very open prayer life with God can help you through many of your darkest moments. 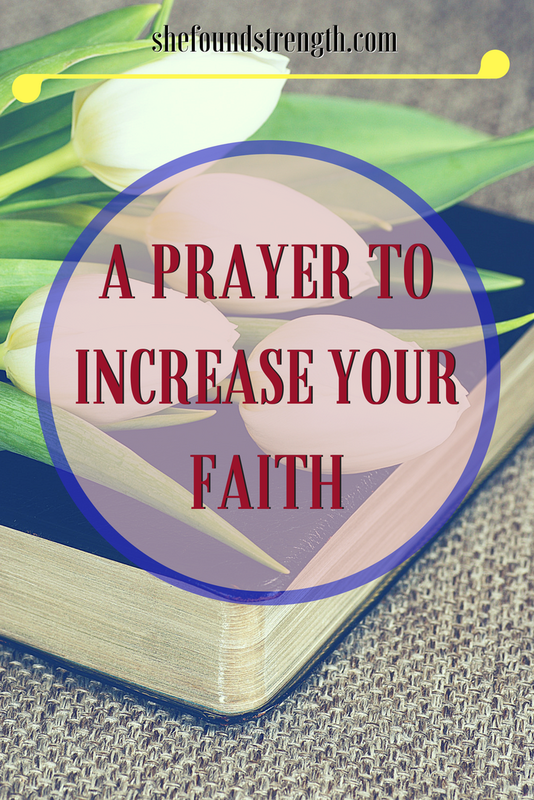 Here is a prayer that I have created and have prayed to God that has help me to increase my faith. I pray that you can use this prayer to increase your faith as well. I believe that you can and will increase my faith within You and myself. Allow my faith to be bigger than my fears. For I want to walk within your glory and have mountain-moving faith. I am determined to excel within the calling that you have on my life. Even when I am afraid, give me the encouragement to continue to push forward. People have spoke against my dreams and have doubts in my future. I speak against the enemy that tries to come against me. I speak against the spirit of delay and cast it away within your Holy name. For my faith is a gift from You and not a result of my efforts. I will not boast about my faith to the non-believers of Your works. No longer will I dwell on what I think I cannot do. For I can do all things through You! No longer will I continue to compare my God given talents to others. For I know that without faith, it is impossible to please You. Pleasing You, God is what I choose to do. Even with faith the size of a mustard seed I can do remarkable things according to our will. Allow me to walk within the fullness of my faith in You.